Ausstellung des polnischen Künstlers Blazej Rusin, visual artist , natural painter and performance, u.a. Initiator des Wandbild-Festivals "Black Circle" in der Ukraine. Die Ausstellung zeigt seine Eindrücke von Görlitz, die er letztes Jahr im September bei einem Besuch mitgenommen hat und anschließend in textilen Collagen sowie Stickereien zum Ausdruck brachte. Auch eine Fotoserie über Görlitz ist entstanden. "Das NATUR-KOLORIT is a project about place. Feeling of Goerlitz. Based on everyday observation of city, its architecture, lifestyle, atmosphere I found out the colourite of it. That was transfered into walls by me. After all I found Goerlitz natural colorit in Ukraine where I live right now. It turned out that they are easy available in second hand shops with German textiles. Out of that I made a series of collages as another form of feeling of Goerlitz." media: series of colorful photos and textile collages. 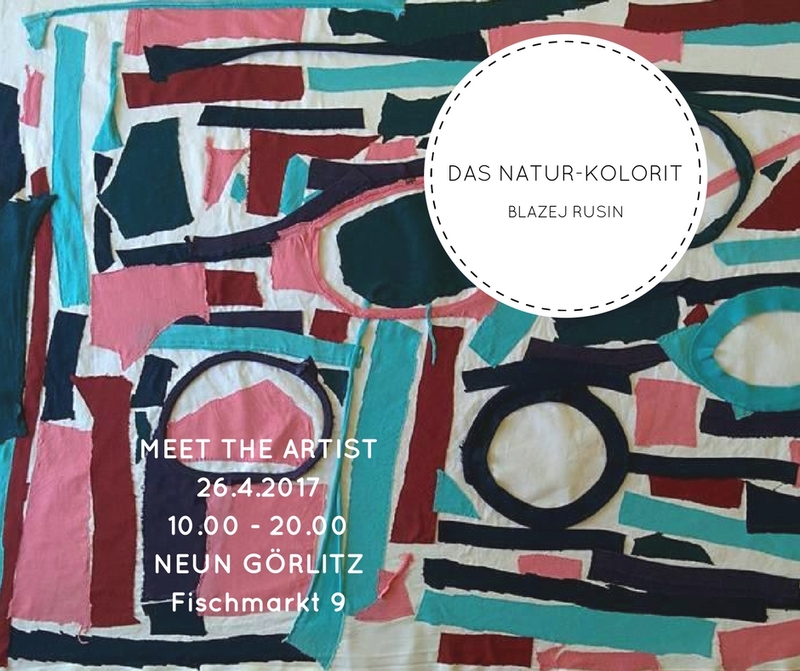 Meet the artist Blazej Rusin on Wednesday April 26th from 10.00 am till 8.00 pm at the space.